Fortnite has stuck strong in the world of video games and comes to our website with an exclusive game for which we have based on its famous skins that delight all its players. The skins are only aspects that you can buy for your character. As you know, Fortnite is a free game in its version Battle Royale, but within the game there is a store where you can spend your turkeys on purchases of skins, picks, hang gliders, dances, etc. This is no more than decorative, since the purchase of any of these objects will not make you stronger or increase your chances of winning in the game. In this game you will be able to know its most famous skins and the best sellers in the game store, since almost everyone has them for their originality. Here, you will not have to face anyone, it' s just about training your brain with a memory game. You will have to find the cards that are the same and you will have to turn them one by one. Remember the image behind the letter and find your partner to clear the level. You have different levels, which will increase in difficulty and for each success chained you will get a plus score. Dare to challenge your mind in Fortnite Battle Memory. 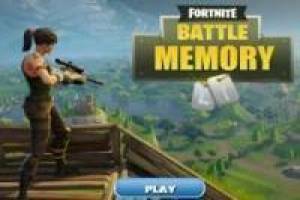 Enjoy the game Fortnite Battle Memory, it's free, it's one of our Fortnite games we've selected.